A shameless plug for a friend. 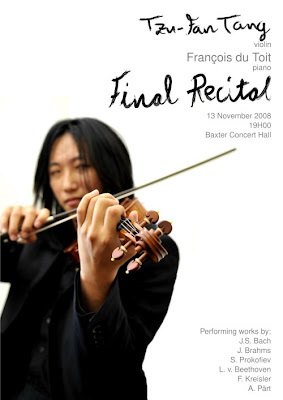 Tzu-Fan is playing his final recital for the university on the 13th November. Its sure so be a mixture of awesome and mindblowing, which I will dub awe-blowing. Anyway here's the poster with the details, I also did allot of the poster (though not the awesome font), so it's also a plug for me I guess.